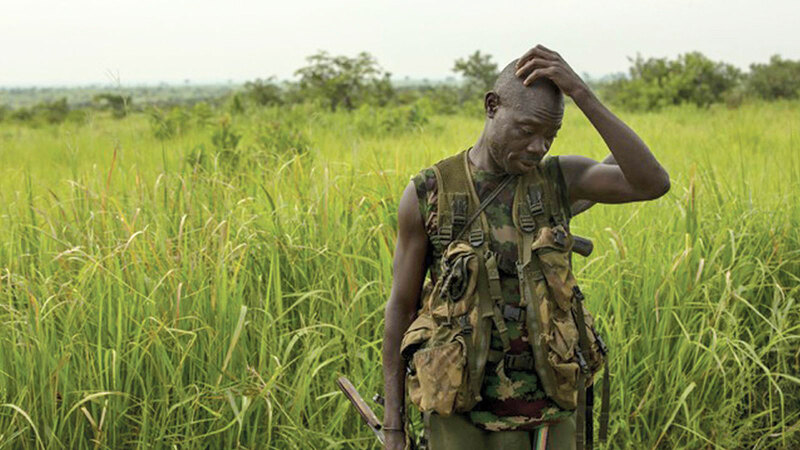 The film follows park rangers who risk their lives daily to stop poachers. At first, the elephant looks like it's asleep. But then you notice it has stumps where there should be feet. Its tusks have been sawed off. And there are countless maggots crawling along a gaping hole in its face. It's a horrifying image as I describe it -- but when viewed as a 360-degree video in a VR headset, it's even more so. You can't easily look away without shutting your eyes. And the three-dimensional sound makes you feel as if you're actually there. This is the most powerful scene in The Protectors: Walk in the Ranger's Shoes, a VR documentary co-directed by Kathryn Bigelow (Zero Dark Thirty, The Hurt Locker) and Imraan Ismail (The Displaced). The film, which debuted at the Tribeca Film Festival this week, gives us a rare glimpse at the lives of rangers working in the Democratic Republic of Congo's Garamba National Park. They risk their lives to stop poachers from killing elephants for their ivory tusks, despite the seemingly insurmountable odds against them. They're vastly outnumbered by poachers, who are better paid and better equipped and can easily hide in the park's vast landscape. And then, of course, there are all the natural dangers they face on patrol. But when you're confronted with the image of that cruelly mutilated elephant corpse, you understand exactly why they risk their lives. As one ranger says during the film, seeing a dead elephant almost makes them feel like they've lost a child. That particular shot could be considered manipulative, but it gets to the heart of what makes VR documentaries powerful. You're not only watching something being projected onto a screen but are also effectively placed in the middle of the action. "When you're doing a normal [traditionally filmed] documentary ... you kind of just hang back, or you're off to the side," Ismail said in an interview with Engadget. "You'd use a longer lens and steal shots -- kind of shine a spotlight. But in VR it's almost as if you have a certain number of flares to light a situation, so you have to be kind of right in the middle of it. ... It's very different. You have to be almost embedded, right in the middle of everything." That sense of immediacy is evident throughout The Protectors. At one point, you're slowly walking through a tall field of grass, unable to see a few feet ahead of you. It's a sequence that's both beautiful and terrifying, since practically anything could be on the other side of the grass. And it's more than a suspense gimmick -- it's a way to communicate something that the Garamba Park rangers face every day. You could shoot a similar scene with traditional cameras easily, but you wouldn't have the effect of looking all around you and being surrounded by tall grass, with the threat of danger lurking everywhere. It's worth pointing out that I didn't see the film in a typical setting. I was sitting in the middle of an audience of dozens of other people wearing Gear VR headsets. They were going through the experience at the same time as me, and it was unique to hear everyone react to the shot of the elephant corpse in unison. In a way, this was the closest a VR experience has come to a traditional film for me. I'm used to the shared experience of watching a film on a big screen, and VR is often accused of being a much more isolating experience. When it came to capturing that elephant-corpse image -- which is something I'll honestly have trouble getting out of my head -- Ismail said he wanted the audience to experience exactly what he was feeling at that moment. "You can imagine just how horrifying and soul destroying it really is, as a person [to confront that elephant body]," he said. "And it then became very easy to say, 'Let's communicate that.' And then, to add to it, for the rangers that's their perspective as well. It's also a defeat." While the film is just eight minutes long, we still get a sense of how the rangers approach their duty. Thanks to their employment by the nonprofit African Parks, which manages Garamba and nine other parks throughout the continent, they have access to health care and education for themselves and their families. But it's also worth noting that the rangers stick with their conservation work even when they could easily make more money by siding with the poachers. For them, it's more of a mission than a job. That's also why it's all the more heartbreaking to see them relying on aging equipment and weapons. Ismail shot The Protectors over three weeks with a crew of just three other people. Since they had to brave the dangers of Garamba as well, they couldn't take much equipment. They relied on a portable camera rig from the VR production company Here Be Dragons, which was basically made up of eight GoPro cameras. Before and after the shoot, he also worked with Bigelow, who's been advocating to save African elephants for years. Her 2014 short film Last Days lays out the problem we're facing if we want to save the elephants from extinction. Perhaps because we were screening The Protectors on Earth Day, former Secretary of State Hillary Clinton made a surprise appearance at the premiere. She discussed being introduced to the plight of the elephants during her tenure in the Obama administration. "It became clear to everyone that this was not just a terrible crisis when it came to the elephant population," she said. "It was a trade -- trafficking that was funding a lot of bad folks, a lot of bad actors. It was being used to take ivory and sell it in order to buy more weapons and support the kind of terrorist activity that these and other groups were engaged in." Ismail hopes that The Protectors will make more people aware of the ranger's work to end elephant poaching (you can support them with donations here). This is still a critical time, after all, since more elephants are being killed than are being born. At this rate, we could lose African elephants entirely within 10 years, according to African Parks' chief marketing officer, Andrea Heydlauff. Gear VR, Oculus Rift and HTC Vive owners will be able to check out The Protectors on May 1st on the Within app. It might sound like a rough experience, but it's one worth watching to gain a full understanding of what the Garamba Park rangers put on the line every day. Follow along with all of our Tribeca 2017 coverage here.